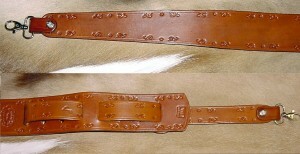 Chisholm’s Trail makes leather guitar straps and leather banjo straps. So strum along with us, partner. We make beautiful leather banjo straps and leather guitar straps. Are you a Country Musician? A Rocker? Want something special for your performances? Nothing will set off your guitar or banjo like our custom leather guitar straps and leather banjo straps. We can even carve or emboss yours with a special pattern or your name or your band’s name if you like. Your fellow musicians will wonder where you got it! You must be a real pro to have such a custom-tailored strap holding your instrument!